Undermount Kitchen sinks are famous for making the transition between the sink and the countertop smooth and seamless. Needless to say, they are perhaps among the best types of Kitchen sinks out there. But choosing the best of them requires knowing the things to look out for. We have reviewed some of the best types you will find around. This article also includes a guide for buyers looking for the best undermount kitchen sinks. The Zuhne MOdena undermount single bowl Kitchen Sink prides itself on being the quietest sink in the market. It comes with a guarantee of minimal noise with daily use thanks to its 5mm sound dampening pads. However, noise reduction isn’t the only impressive quality of this sink. 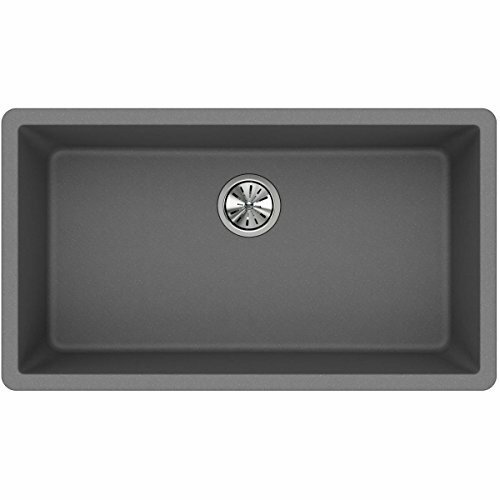 This 16 Gauge thick sink is designed with a 10-inch basin. This not only conveniently conceals your dishes within it but also ensures minimal water splash while in use. In addition to being stylish and functional, this sink also features premium aesthetics and has a scratch-free, easy-to-maintain finish. Its construction is heavy-duty which makes it suitable for both commercial and residential kitchens. Additionally, it doesn’t retain stains and can simply be wiped off with a cloth to clean. It can be used to drain both boiling or cold water without worrying about condensates causing damage to the sink. Made from premium quality composite quartz and acrylic resin, you can be sure of the long-lasting durability of this sink. Its composition also gives it the feel and quality of the real stone. Thanks to its build and finish, this heavy-duty sink can withstand extreme temperatures that will normally damage other sink types. It is also naturally hygienic. On top of that. It is non-porous. This means you don’t have to worry about your sink getting stained by any type of liquid. It's 33” size gives you sufficient workspace which is further optimized by its rear drain setting. The bottom of the sink is designed to be sloppy. This ensures easy and quick draining. Also, this sink is designed to be naturally hygienic. It has a smooth and attractive surface which is quite easy to wipe. There is no stain retention at all since it is non-porous and consequently non-absorbent. 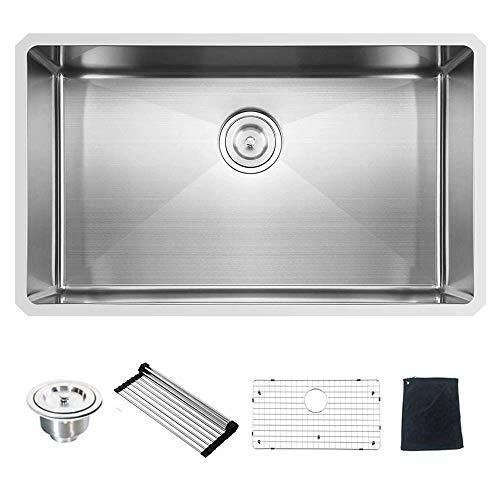 This 16 gauge thick stainless steel sink has been designed to fit in both residential and even commercial kitchens. First, it has a rust-resistant, Nickel/Chromium composition which ensures durability. Then its heavy duty spray coating makes it resistant to damages from condensation. The spray coating also works in conjunction with its sound guard padding to ensure absolutely noiseless use. As regards maintenance, this sink is quite easy to clean. To ensure that the inside is just as easy to clean, it is designed with the right amount of curvature. This ensures that it doesn’t retain food and dirt particles in the corners. Also, the finish of this sink focuses just as much on the interior as it does on the exterior. Instead of the usual dull finish of most other sinks, this one has a commercial grade brushed finish which adds to its overall appeal. Whether for modern or contemporary kitchens, this premium quality kitchen sink is a perfect centerpiece on your countertop. With a depth of up to 10inches and width that allows it to fit in multiple pots and pans at once, you have no worries about space with this sink. Apart from its sturdy steel construction which guarantees durability, it also sports a premium satin finish. Thus making it suitable for commercial kitchen activities without scratching or rusting. It’s Thick Rubber Dampening Pads help to insulate sound. Likewise, a stone Guard Undercoating further ensures the sink makes as little noise as possible during use. 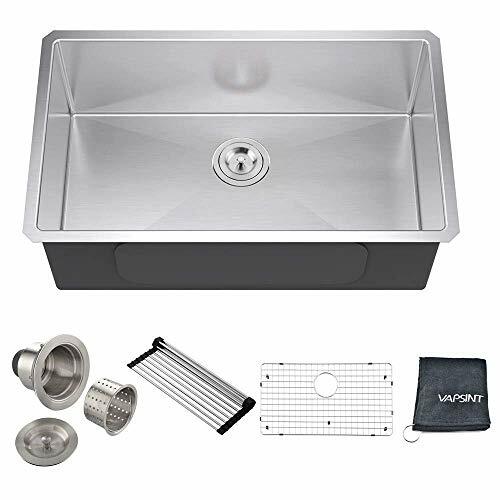 With premium quality, rugged 16-gauge stainless steel build, you can be guaranteed of the durability of this kitchen sink. Not only is it designed to be rust resistant, but It is also dent-resistant as well. It features an undermount design that makes the transition from countertop to sink quite convenient. This way cleaning your sink is quite easy. 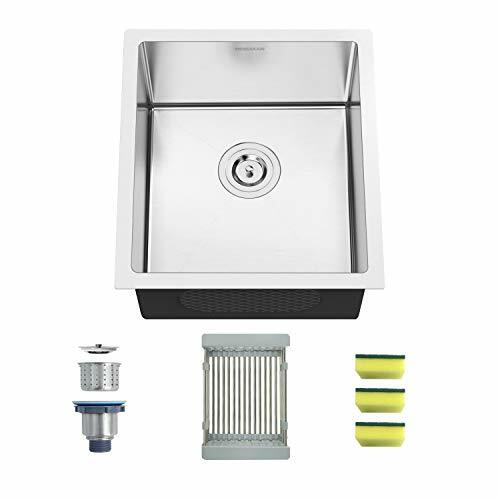 Additionally, you don’t also have to worry about them being able to drain the water effectively since this sink features an off-set drain opening with channel grooves. Noise defending technology is another note worthy feature of this sink. It is conveniently insulated to prevent noise from water splashing or when washing plates in the sink. It also comes with other luxurious accessories as well. Thus sink comes in a variety of color options ranging from brown to grey, black, greige and white. Thus there is no question about finding one that matches your kitchen decor and style. There are plenty of other reasons to like this top quality undermount kitchen sink. First, it is deep and wide giving you sufficient space to stack your dishes and other items. You also won’t have to worry about water splashing on the floor or countertop with this sink. Another feature you will most definitely like as well as how resistant this sink is to damages due to heat, stain, and scratch. Fine quartz which makes up the bulk of this sink is able to withstand temperature as high as 535° Fahrenheit and can easily be cleaned from stains by simply wiping with soapy water since it doesn't absorb liquids. 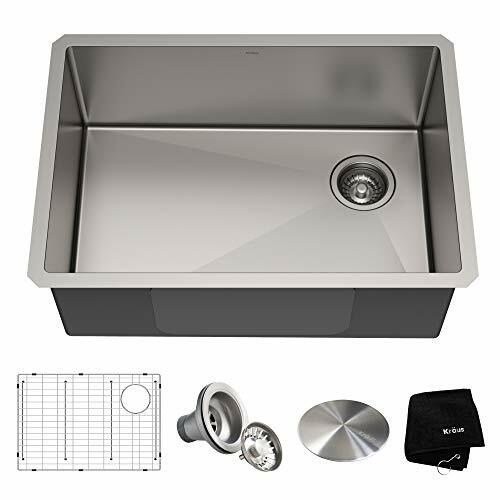 If you are looking for sink as indestructible as it gets, then this stainless steel sink is one to go for. This high-grade heavy duty model from Mensarjor is designed to be dent resistant. It will also remain in top shape for a long time to come. Apart from being 16 gauge thick which improve its noise-resistance, this kitchen sink also comes with thick rubber mesh pads. They are quite soft and are able to resist vibrations thus ensuring silence while you are working. Hand made to perfection, this sink has been fabricated for ease of use. It also add stylish beauty to whatever kitchen you are installing it on. This sink is made from non-toxic material and is quite easy to maintain. This 29 inches undermount kitchen sink is a double bowl sink. This sink is suited for a wide range of residential and even commercial kitchen settings. 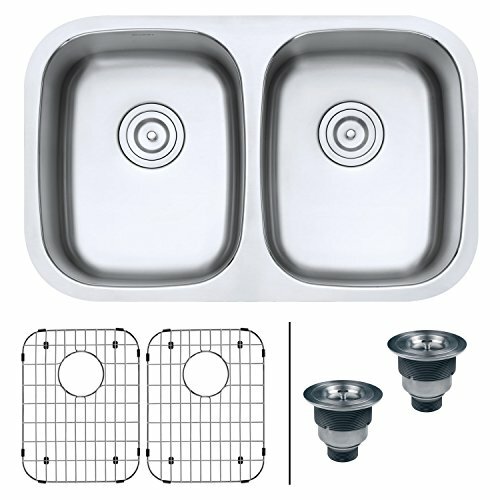 Th Ruvati 29-inch Undermount 50/50 Double Bowl Kitchen sink is made from top quality stainless steel. On top of that, it has a brushed finish both of which makes the sink durable and at the same time makes cleaning convenient without fear of scratching. In addition to all its other top quality installation features, the sink is also built to make as minimal noise as possible. It is padded with thick rubber and has sound guard undercoating. Thanks to these, your sink doesn’t sound hollow which minimizes the noise. Furthermore, these features also help to prevent condensation from forming on the sink which may cause damage. From one of the top kitchen sink makers comes one of the best undermount kitchens sinks you will find around. Specially handcrafted from 16 gauge thick commercial grade stainless steel, you can always be sure of the durability of this sink. Thanks to its sturdy build, you can be assured of a sink strong enough to keep its attractive assurance for many years of intensive use. Moreover, its brushed steel finish not only makes sure it is attractive and matches your kitchen fixtures, but it also makes protect the sink from damages as well. A deep basin prevents splash and gives you sufficient work space. Frigidaire stainless steel sink makes use of V-Therm Shield technology in addition to its tight and sleek design to minimize noise. 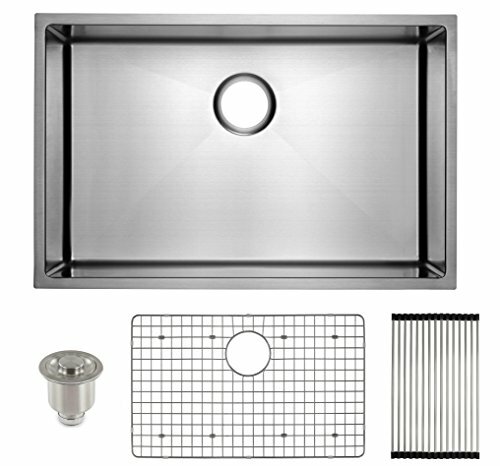 The Vapsint commercial stainless steel kitchen sink is one of the most massive kitchen sinks on our list. It is also quite thick as well. With such massive size and sturdy build, you better assured of durability. Its thickness also contributes to the noise dampening ability of your sink too. On top of that, it comes with 3mm cushion pads which further improves this ability. This sink’s commercial grade is something else you will most definitely find attractive. Not only does it match most countertop types it also fits in with other kitchen fixtures as well. It is also resistant to stain and scratch ensuring a long life-span of active use for the sink. The drain is placed at the rear which enables easy flow of water into the drain. This at the same time prevents the drains from getting clogged by debris and food. 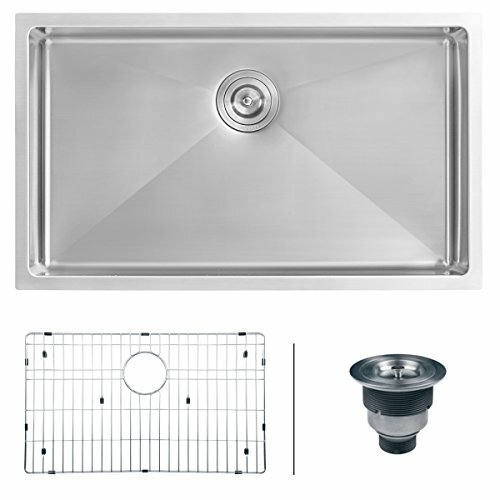 To pick the best undermount kitchen sink, it is imperative that you consider some important features. Your choice be an attractive one. 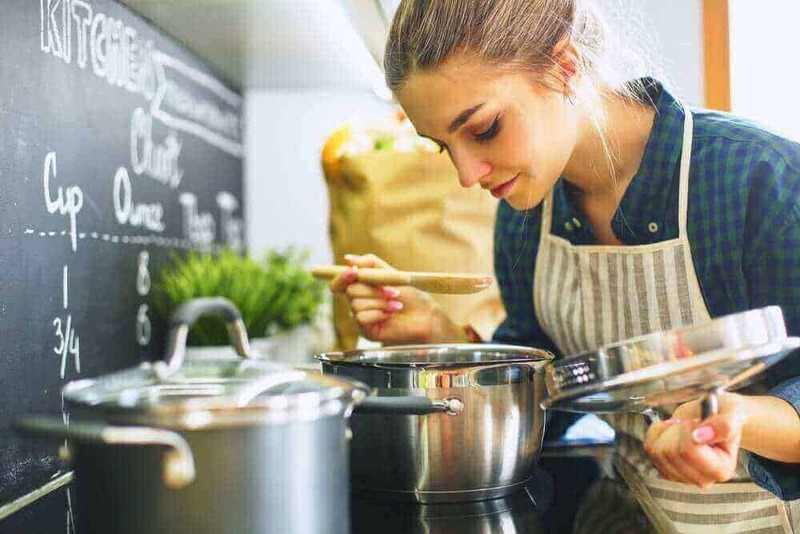 At the same time it must also meet your basic needs and fit into your kitchen as well. Here are a few points to consider. This is a no-brainer. Size is an important factor to consider when shopping for an undermount sink. Regarding this, the perfect size depends on a combination of factors. First, you should consider how much dishes your sink will have to handle. But also of equal or even greater importance in some cases is your kitchen cabinet size. Your choice at the end of the day should be a model that fits into your kitchen cabinet. There are cases where the overall size of your kitchen even comes to play in your choice of sink size too. Bear in mind that size here isn’t all about the width or length. Depth is just as important as well and must be considered. The gauge is the measurement of thickness, especially in stainless steel sinks. It makes sense to reason that a higher thickness should translate to higher strength and durability of your sink. You should try to go for a model that is thick enough to resist dings and dents. In this case, stainless steel sinks with a thickness of 18-gauge or less are recommended. Your undermount sink will almost certainly have to face temperature extremes and will also be bombarded by stains of various kinds. Which is why choosing a model that is resistant to heat and stain is imperative. While this isn’t something you can readily guess by reading the product’s specs and description, you can check out reviews and see what users have to say about it. Although stainless steel is the most common construction material, models like the Elkay Quartz undermount sink are made of quartz. They are quite resistant to heat too. 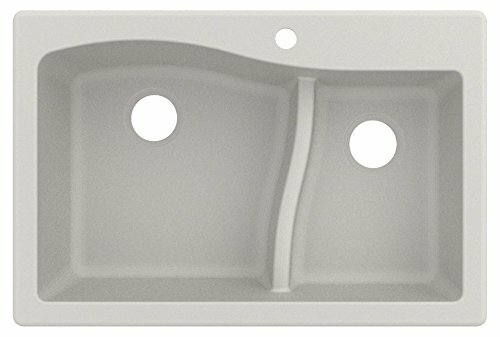 As you have probably noticed in our review of the undermount kitchen sinks, being noise-resistant is an important criterion. Most top quality sinks come with sound pads or insulating foams to reduce how much noise it makes. 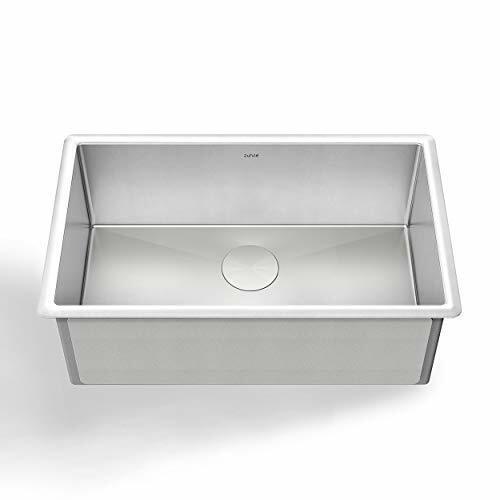 You should look out for this when making your choice as well.Some, sinks like the Kraus Standart PRO mentioned in this review comes inbuilt with special technology that minimizes noise to the barest minimum. 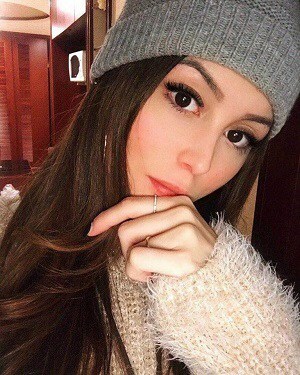 Style and beauty is a major factor to consider. The sink is a sort of centerpiece in your kitchen. Which means whatever type or model you are choosing should be one that blends in with your countertop. It should also fit in with your kitchen decor and other fixtures in the room as well. The finish is one of the major deciders of how well your undermount sink is able to blend in. Additionally, the finish also contributes to durability. Your sink should be resistant to staining and tarnishing. At the same time, it must be easy to clean as well. Design features such as position of the drain hole and shape of the bowl base are also important as well. They will determine how other features like a garbage disposal unit and even a faucet will fit onto your sink. This shape will also determine how well the sink will drain water and how easy it will be to clean too. Other factors like price and brand name also come to play when choosing the best undermount kitchen sinks. Most reviews recommend buying sinks from recognized brands with a guarantee of quality. However, this isn't to say that the less popular models are not great options as well. This article can serve as a buyer’s guide. Along with it, we have reviewed some of the best options available for you out there. It should assist you and make finding the best products easy.